It was the summer of 1995 and I was proud to be a part of the community efforts to help sign young black men up to attend the Million Man March. In the year leading up to the march, I worked tirelessly to plan events, spread the word and drum up support for the much talked about gathering that was slated for the mid-fall season. I traveled to the Washington, D.C. headquarters to answer telephone calls. I went door-to-door passing out flyers. I even remember setting up a lemonade stand with a youth group, giving away freshly made lemonade to the men and boys in my community. It didn’t matter if they were young or old, the only price they had to pay that day was signing up to go to the march. Even though the march was for “men only,” I was glad to help in other ways. I supported the idea of corralling one million black men together to talk about atonement, taking care of their families and communities and becoming better men. This was a cause I could get behind. The Million Man March, held on October 16, 1995, is a date etched in my memory. Whether you believe the media reports that said only 400,000 men attended or other accounts that said one million plus men were there, it doesn’t really matter. The men I know that attended came back changed forever. They had experienced what it felt like to unite for one common cause that day. They stood together for hours, listening to speaker after speaker, without violence or mistrust, and walked away with open hearts. Many of them cried. They hugged strangers, held hands, made new friendships and shared stories. They held much in common. They witnessed a healing that was long overdue. The energy of brotherhood was said to be both overwhelming and life changing. I saw the after effects. 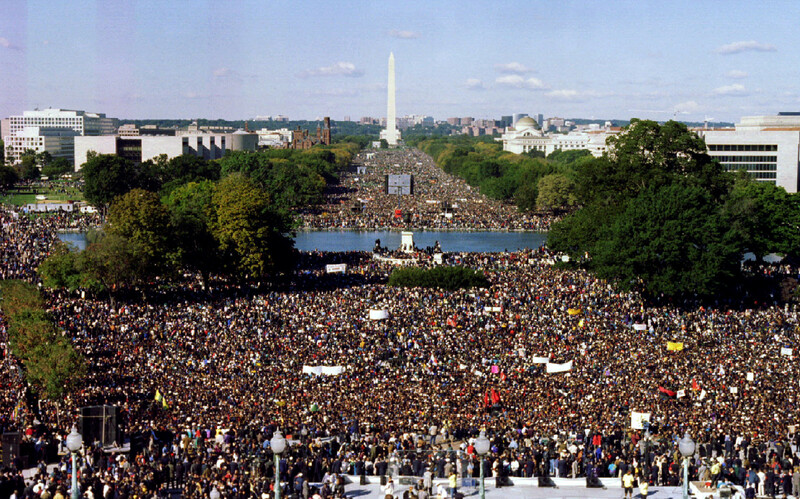 As the community converges on Washington, D.C. this weekend for the Justice or Else Movement, the 20th Anniversary of the Million Man March, I am encouraged once again. March organizers say the rally is intended to protest a failing education system, police brutality and other issues that disproportionately impact the African American, Latino and Native American communities. My hope is that we, the people, leave inspired and that we take away some bit of wisdom and courage to transform our condition, even if it happens one person at a time. I believe in the change that’s to come. Happy 20th Anniversary to all the men and women who made history on Oct. 16, 1995.